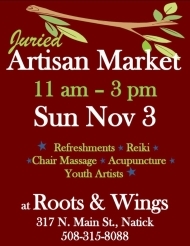 Artisan Market Benefit | Roots and Wings yoga and healing arts, Natick, MA"
This year, the Roots and Wings Annual Artisan Market and Benefit is bigger and better than ever. Shoppers will enjoy live music as well as complementary refreshments provided by Whole Foods. Our wide range of remarkably talented artists will be offering: children's books (author/illustrators), quilts, ceramics, mosaics, multi-media sculpture, all natural lavender products, photography, jewelry, hand-made chocolates, sterling silver, wampum treasures, felted vessels, figures and accessories, elaborate dream catchers, up-cycled skate board creations, unique dog toys/accessories and many more unique and finely crafted items. Surely we have something for everyone on your shopping list! While getting a jump on holiday shopping, take a chance on one of our treasure filled raffle baskets with prizes from art lessons to facials to a series of yoga classes. Great for gifts! You can also indulge yourself in a chair massage, reiki session or even a tarot card reading! Last but not least, be sure to visit our youth artisan market featuring up and coming artists from ages 8 to 13 selling their jewelry, paintings, candles, ornaments and many other wonderful works of art. Join us on location, here at Roots & Wings. We have just started a nonprofit arm called Branching Out for Youth. Over the past several years, we have provided fundraising for nonprofit organizations (The Peace Abbey, Yoga Reaches Out, and Partners in Health) as well as individuals in need (specifically two mothers in medical crisis). We have donated space, funded advertising and provided a meeting place for support groups and services in our Metrowest community. Examples include Beacon Hospice (motherless mothers support group), BenSpeaks (empowerment groups for girls), and the Multicultural Villiage (staff development and retreat). Our yoga classes raised money for Toys for Tots, Haiti relief, New Orleans relief, Parmenter Food Pantry, the Autism Alliance of Metrowest, and more. Many times, people walk into our building and tell us their story: a story of trauma, financial upset, grief, and more. We have provided free and reduced fee classes and healing arts services to help these people find relief, relaxation, and healing. We've learned from the stories, where somehow it becomes clear that we are all in this together, and it is from here that our nonprofit organization was birthed: Branching Out for Youth. This year we feature our popular Artisan Market with local artisans, our Youth Art Sale with entrepreneurial youth artists, and our community connections with local organizations highlighted such as SPARK (formerly the Natick Anti-Bullying Coalition), Natick Together for Youth, Multicultural Village, Stretch What Matters, BenSpeaks, and more. For more information, or to be a part of the Artisan Market, the Youth Art Sale, the community connections with local organizations, or to join the fun and holiday shopping, email or call.